The Perfect Valentine's Day Gift From Tiffany & Co.
Valentine’s Day may be a traditional holiday, but you certainly don’t have to treat it as such. This year, skip the flowers and chocolate in favor of something more glamorous. Tiffany Celebration® rings are perfect for adding to your wish list or as a brilliant gift to yourself. After all, love, in any form, is something to be celebrated. Tiffany & Co. invites you to commemorate all the important occasions in your life—whether it’s a new job, college graduation, major birthday, or a milestone anniversary—with a beautifully crafted Tiffany Celebration® ring. Buy just one or create your own unique stack; either way, you deserve it. Click through to shop the collection today. 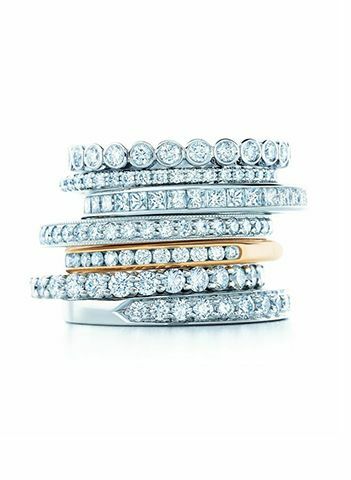 If diamonds really are a girl’s best friend, then we spot seven very sparkly allies in this stack. (From top): Tiffany Jazz™ in Diamond Ring Patinum ($3675), Tiffany Metro Diamond Ring in 18K White Gold ($1900), Dimaond Band Ring in Platinum ($5250), Dimaond Milgrain Band Ring in Platinum ($3600), Channel-Set Band Ring with a Half Circle of Diamonds in 18K Yellow Gold ($2275), Diamond Band Ring in Platinum ($6250), and Half Circle Diamond Band Ring in Platinum ($2725). Always one step ahead, this fashion-forward woman has an affinity for modern, statement-making designs. (From top): Tiffany Metro Diamond Ring in 18K Yellow Gold ($1900), Tiffany Novo® Diamond Ring in 18K Rose Gold ($3150), Tiffany Bezet™ Diamond Ring in 18K Rose Gold ($2050), and Diamond Ring in Platinum ($2575). A thin band covered in diamonds is equal parts elegant and fuss-free, just like your minimalist sensibilities. Tiffany Novo® Diamond Band Rings (from top): 18K Yellow Gold ($3150), Platinum ($3575) and 18K Rose Gold ($3150). Exquisite shapes and craftsmanship set these designs apart from the rest. (From top): Three-Row with Diamonds ($9200), Tiffany Swing with Diamonds and Sapphires ($3900), Tiffany Cobblestone with Diamonds ($12,000), and Tiffany Victoria™ with Diamonds ($13,000). Don’t be surprised if these band rings garner a double (or triple, for that matter) take. (From left): Tiffany Victoria™ ($15,000), Braided ($7950), Geometric with Aquamarines and Sapphires ($8500), Scroll ($11,000), Tiffany Aria ($13,500), and Wide Ring with Emeralds and Sapphires in Platinum (price upon request). These demure pieces are nothing short of elegant. (From top): Tiffany Swing Diamond Ring, Tiffany Swing Diamond and Pink Sapphire Ring, Tiffany Aria Diamond Ring ($10,800-$11,300).